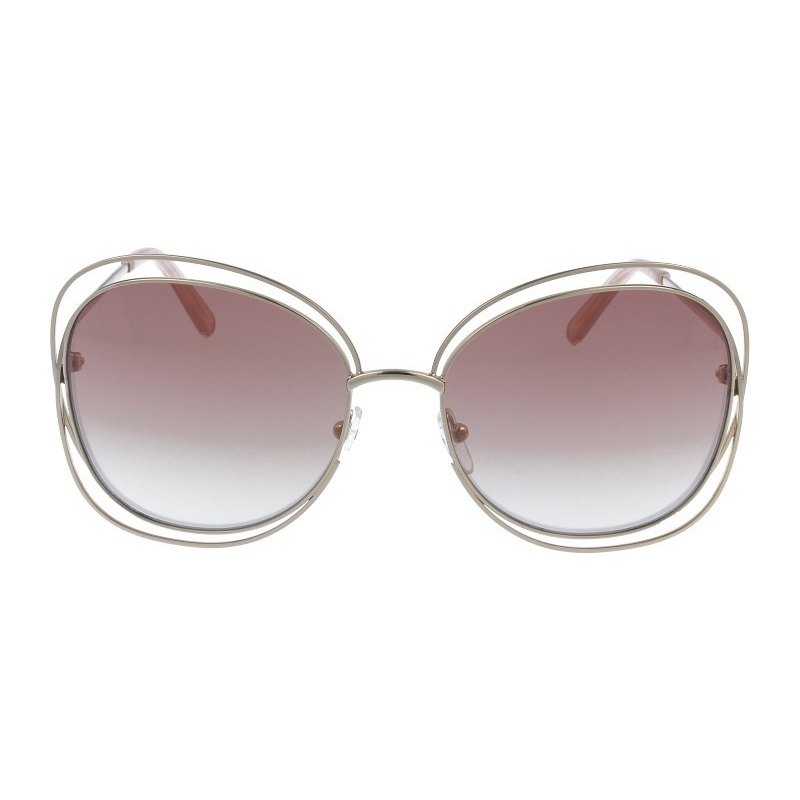 Sunglasses by the brand CHLOÉ for Women’s sunglasses, with reference S0007942, with a(n) Formal, Modern, Elegant, Glam and Female style.Chloé Carlina 120 774 58 23 they have a(n) Full Rim frame made of Metal with a(n) Round shape in Silver colour. Their size is 58mm and their bridge width is 23mm, with a total frame width of 81mm. They have Organic, Gray, Gradient lenses. These glasses aren't suitable for prescription lenses. These are top of the range glasses from the brand CHLOÉ, made of high-quality materials, modern glasses that will give you a look that matches your image. Buy Chloé Carlina 120 774 58 23 sunglasses in an easy and safe way at the best price in our online store. Sunglasses by the brand CHLOÉ for Women’s sunglasses,  with reference S0009243, with a(n) Formal, Modern, Elegant, Glam and Female style.Chloé Carlina 114 706 58 18 they have a(n) Full Rim frame made of Metal with a(n) Round shape in Golden colour. Their size is 58mm and their bridge width is 18mm, with a total frame width of 76mm. They have Organic, Blue, Gradient lenses. These glasses aren't suitable for prescription lenses. These are top of the range glasses from the brand CHLOÉ, made of high-quality materials, modern glasses that will give you a look that matches your image. Buy Chloé Carlina 114 706 58 18 sunglasses in an easy and safe way at the best price in our online store. string(137) "Buy Chloé Carlina 114 706 58 18 sunglasses. Modern and elegant model. Original product with fast shipping, quality guarantee and refund." string(28) "Chloé Carlina 114 706 58 18"
Sunglasses by the brand CHLOÉ for Women’s sunglasses, with reference S0008822, with a(n) Formal, Modern, Elegant, Glam and Female style.Chloé Carlina 129 784 59 16 they have a(n) Full Rim frame made of Metal with a(n) Square shape in Golden colour. Their size is 60mm and their bridge width is 18mm, with a total frame width of 78mm. They have Organic, Brown, Gradient lenses. These glasses aren't suitable for prescription lenses. These are top of the range glasses from the brand CHLOÉ, made of high-quality materials, modern glasses that will give you a look that matches your image. Buy Chloé Carlina 129 784 59 16 sunglasses in an easy and safe way at the best price in our online store. string(137) "Buy Chloé Carlina 129 784 59 16 sunglasses. Modern and elegant model. Original product with fast shipping, quality guarantee and refund." string(28) "CHLOÉ CARLINA 129 784 59 16"
Sunglasses by the brand CHLOÉ for Women’s sunglasses,  with reference S0008821, with a(n) Formal, Modern, Elegant, Glam and Female style.Chloé Carlina 119 724 60 18 they have a(n) Full Rim frame made of Metal with a(n) Square shape in Golden colour. Their size is 60mm and their bridge width is 18mm, with a total frame width of 78mm. They have Organic, Brown, Gradient lenses. These glasses aren't suitable for prescription lenses. These are top of the range glasses from the brand CHLOÉ, made of high-quality materials, modern glasses that will give you a look that matches your image. Buy Chloé Carlina 119 724 60 18 sunglasses in an easy and safe way at the best price in our online store. string(137) "Buy Chloé Carlina 119 724 60 18 sunglasses. Modern and elegant model. Original product with fast shipping, quality guarantee and refund." string(28) "CHLOÉ CARLINA 119 724 60 18"
Sunglasses by the brand CHLOÉ for Women’s sunglasses,  with reference S0008820, with a(n) Formal, Modern, Elegant, Glam and Female style.Chloé Carlina 114 702 58 18 they have a(n) Full Rim frame made of Metal with a(n) Round shape in Golden colour. Their size is 58mm and their bridge width is 18mm, with a total frame width of 76mm. They have Organic, Pink, Gradient lenses. These glasses aren't suitable for prescription lenses. These are top of the range glasses from the brand CHLOÉ, made of high-quality materials, modern glasses that will give you a look that matches your image. Buy Chloé Carlina 114 702 58 18 sunglasses in an easy and safe way at the best price in our online store. string(137) "Buy Chloé Carlina 114 702 58 18 sunglasses. Modern and elegant model. Original product with fast shipping, quality guarantee and refund." string(28) "CHLOÉ CARLINA 114 702 58 18"
Sunglasses by the brand CHLOÉ for Women’s sunglasses,  with reference S0008819, with a(n) Formal, Modern, Elegant, Glam and Female style.Chloé Carlina 114 751 62 18 they have a(n) Full Rim frame made of Metal with a(n) Round shape in Golden colour. Their size is 62mm and their bridge width is 18mm, with a total frame width of 80mm. They have Organic, Green, Gradient lenses. These glasses aren't suitable for prescription lenses. These are top of the range glasses from the brand CHLOÉ, made of high-quality materials, modern glasses that will give you a look that matches your image. Buy Chloé Carlina 114 751 62 18 sunglasses in an easy and safe way at the best price in our online store. string(137) "Buy Chloé Carlina 114 751 62 18 sunglasses. Modern and elegant model. Original product with fast shipping, quality guarantee and refund." string(28) "CHLOÉ CARLINA 114 751 62 18"
Sunglasses by the brand CHLOÉ for Women’s sunglasses,  with reference S0007848, with a(n) Formal, Modern, Elegant, Glam and Female style.Chloé Carlina 114 784 62 18 they have a(n) Full Rim frame made of Metal with a(n) Round shape in Golden colour. Their size is 62mm and their bridge width is 18mm, with a total frame width of 80mm. They have Organic, Brown, Gradient lenses. These glasses aren't suitable for prescription lenses. These are top of the range glasses from the brand CHLOÉ, made of high-quality materials, modern glasses that will give you a look that matches your image. Buy Chloé Carlina 114 784 62 18 sunglasses in an easy and safe way at the best price in our online store. string(137) "Buy Chloé Carlina 114 784 62 18 sunglasses. Modern and elegant model. Original product with fast shipping, quality guarantee and refund." string(32) "Chloe CARLINA 114 784 Sunglasses"
string(28) "Chloé Carlina 114 784 62 18"
Sunglasses by the brand CHLOÉ for Women’s sunglasses,  with reference S0007840, with a(n) Formal, Modern, Elegant, Glam and Female style.Chloé Carlina 120 724 58 23 they have a(n) Full Rim frame made of Metal with a(n) Round shape in Silver colour. Their size is 58mm and their bridge width is 23mm, with a total frame width of 81mm. They have Organic, Brown, Gradient lenses. These glasses aren't suitable for prescription lenses. These are top of the range glasses from the brand CHLOÉ, made of high-quality materials, modern glasses that will give you a look that matches your image. Buy Chloé Carlina 120 724 58 23 sunglasses in an easy and safe way at the best price in our online store. string(137) "Buy Chloé Carlina 120 724 58 23 sunglasses. Modern and elegant model. Original product with fast shipping, quality guarantee and refund." string(31) "hloe CARLINA 120 724 Sunglasses"
string(28) "Chloé Carlina 120 724 58 23"
Sunglasses by the brand CHLOÉ for Women’s sunglasses,  with reference S0007807, with a(n) Formal, Modern, Elegant, Glam and Female style.Chloé Carlina 120 736 58 23 they have a(n) Full Rim frame made of Metal with a(n) Round shape in Golden colour. Their size is 58mm and their bridge width is 23mm, with a total frame width of 81mm. They have Organic, Brown, Gradient lenses. These glasses aren't suitable for prescription lenses. These are top of the range glasses from the brand CHLOÉ, made of high-quality materials, modern glasses that will give you a look that matches your image. Buy Chloé Carlina 120 736 58 23 sunglasses in an easy and safe way at the best price in our online store. string(137) "Buy Chloé Carlina 120 736 58 23 sunglasses. Modern and elegant model. Original product with fast shipping, quality guarantee and refund." string(32) "Chloe CARLINA 120 736 Sunglasses"
string(28) "Chloé Carlina 120 736 58 23"